Nature Rambling: What You Can Do with Poo? What You Can Do with Poo? reluctantly agreed that tool use was not uniquely human, but that it certainly was restricted to the great apes, mankind’s closest relatives. Then ornithologists reported that many birds engaged in activities considered to be tool use; e.g., the Galapagos woodpecker finch shapes twigs and cactus spines to pry insects out of their hiding places. Other birds use rocks to break open ostrich eggs and several herons throw objects onto the water surface to attract their fish prey. And now the Burrowing Owl can join the tool using club. True to its name, the Burrowing Owl inhabits burrows in pastures, rangeland, golf courses and other open spaces with low or sparse vegetation. Unlike other owls it is active during the day and night and can be seen standing in or near the opening of its burrow. In the west they are primarily found in prairie dog towns; in the east they were formerly found in pastures and golf courses inhabited by ground squirrels. Some populations still survive in Florida. Like other small owls they feed on insects and small mammals. 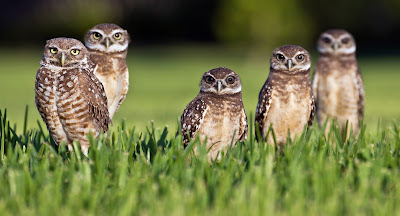 In a colony of burrowing owls University of Florida researchers noticed a curious thing: the burrow entrances were “decorated” with mammalian dung. This was not an accident because when the investigators removed the dung it was soon replaced. But why? At least two possibilities suggest themselves: The odor of the dung might mask the presence of young owls or eggs from predators, or the dung could attract dung beetles, potential food for the owls. The first possibility was tested by placing quail eggs in vacant burrows. Then dung was collected and placed around half the burrows that had quail eggs. If the dung masked the scent of eggs there should be less predation on the dung-protected burrows. But the results showed that eggs were equally likely to be eaten whether the burrow was “protected” or not. The burrows decorated with cow dung had pellets that contained 10 times more dung beetle parts and 6 times more dung beetle species than those without dung. So the answer to the question posed in the title of this post is: like the herons, you can fish using dung for bait. Levey, D.J., Duncan, R.S., and Levins, C.F. (2004). Animal behaviour: Use of dung as a tool by burrowing owls. Nature 431, 39–39. Nifty. Am not sure how I'll bring that up during a dinner conversation though. You could do like the owls -- bring it up after dinner! I like this new project, Dale!